On a road trip with friends through the Carmel Valley, I thought of the late Mimi Fariña, singer-songwriter/guitarist and the founder of Bread & Roses, the nonprofit organization where I have worked since 1996 bringing live music to people who are isolated and need it most. 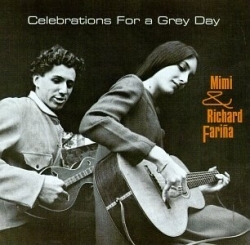 It was Mimi’s personal story and the harmonies within her music-making with her husband, the late Richard Fariña, that compelled me to understand as well as feel her inextricable connection to the healing power of music. And in a series of related life events, drew me like a clarion call to work as a concert producer for Bread & Roses. How could I journey to Carmel so many years after she died and not feel all the connections through the fine mists that drifted like ethereal scarves transparently through the valley? 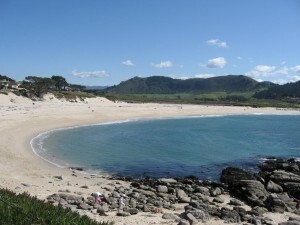 On the beach where the Carmel River meets the Pacific Ocean, reflections arose as waves crashed into the sea, waves roaring immensely over the sand bar giving dwindling numbers of salmon and steel-head trout a fighting chance to find their way upstream to spawn. Maybe that is all the time that any of us have — a short window, a defined span, to move ahead, to take the plunge, or not. As we drove up the valley road, amidst the greenest hills of late winter, I wondered how it was for Mimi when she lived there with Richard Fariña, her husband, her love. The man with whom she eloped in a fit of rebellion when she was 17 and living with her family in Paris, then came to live with in a little cabin in the Carmel River Valley. There they loved each other, wrote songs and rehearsed their harmonies for their best-selling album Celebrations for a Grey Day. And the story goes that at a surprise party for her 21st birthday, he headed out on the back of a motorcycle taking the twists and turns of the road east to Cachagua, going 90 in a 30 mile-per-hour zone. He was thrown into a field and the next time she saw him was at the morgue. I cannot fully imagine the shock and grief she must have felt at that moment but I understand as a result why she dedicated her life to healing. Near the Carmel Mission was the Thunderbird bookstore where Richard Fariña had his last signing of his novel I’ve Been Down So Long It Looks Like Up to Me. In a photo from that day one can see that Mimi had a strained smile, thinking Richard had forgotten her birthday. But shortly thereafter, he’d surprised her with a party. And after he died and she returned to their cabin, she found wilted flowers that he had bought along with a new pair of shoes that she’d admired in a shop window. The man she’d loved at the pinnacle of her young life she put on a inevitable pedestal through all the years of healing work and giving back to others. There were other men who did their best to love her, often finding an uphill climb. How quickly it all happens sometimes — they had three years for what they were to accomplish as a team, several best-selling albums and a novel that captured the spirit of the 60s. They forged their own authentic sound with guitar and dulcimer and dulcet harmonies. When they traveled out from that little cabin they were the toast of the town. But just as quickly, it was all gone — the dashing young couple on the dance floor, never to dance together again. In the Bread & Roses office are three photos of Mimi dancing exuberantly as a very young woman on the sands. 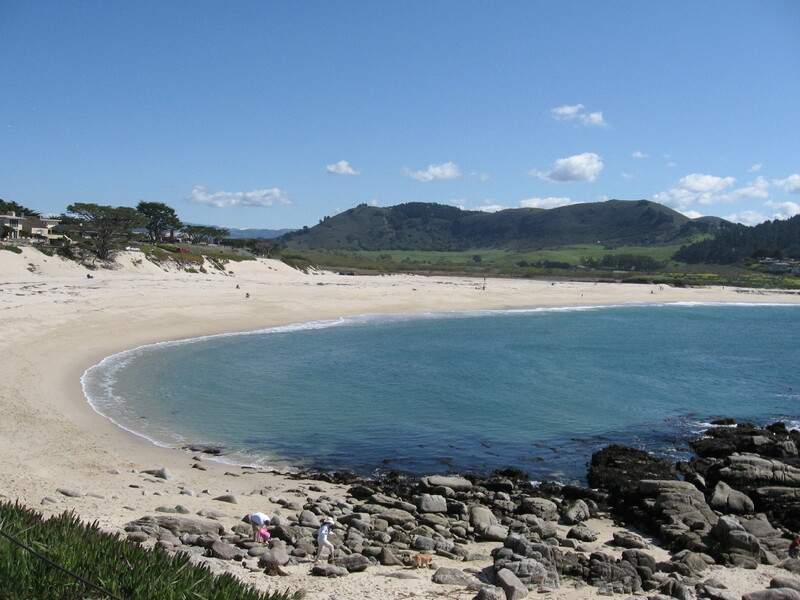 At the Carmel River State Beach, I imagined where she may have danced with limber body at the edge of the surf in wild arabesque. Those photos were given back to her when she had cancer in her mid-fifties so that she could remember her wild, unbridled passionate self as she fought for her life. She was taken before her time. At 56, she was in her prime. She had things she still wanted to accomplish — a book and more to add to the legacy she’d left after 25 years directing Bread & Roses. Email marian@marianhubler.com to be added to list for future blogs. 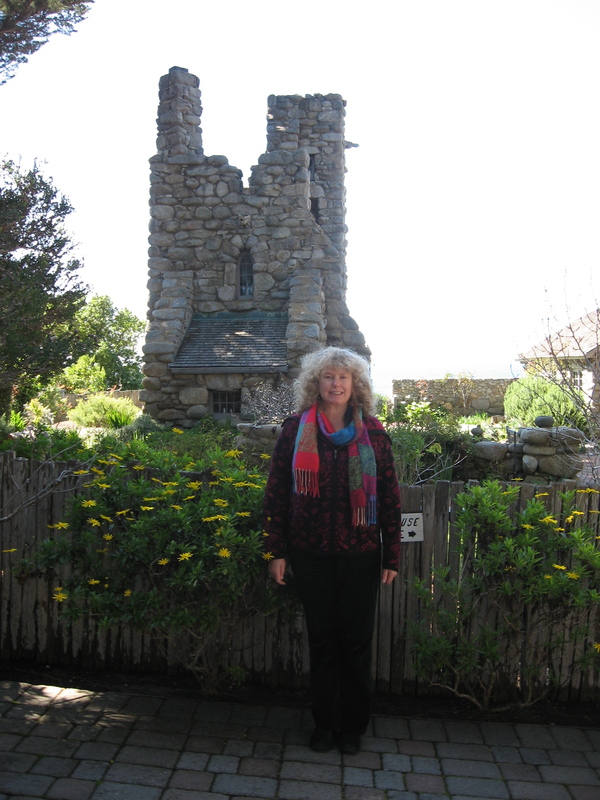 Journey to Carmel to visit the poet Robinson Jeffers’ Tor House and take a docent tour to learn about his life. Seek out other literary museums whenever one travels. In Salinas, don’t miss the John Steinbeck Cultural Center and house where he was born. Beautifully and tenderly written, Marian. I knew virtually nothing about Mimi Farina until I read your essay. She must be an enduring inspiration to you and so many others.